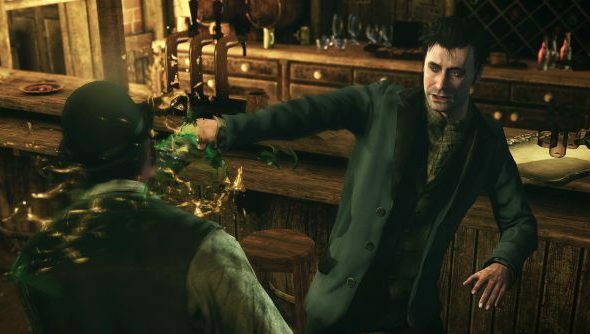 The Sherlock Holmes games have something of a cult following, quite popular despite their low budgets thanks to fantastically designed puzzles and clever narratives. They also usually involve you, and Holmes, looking like a fool as you send a child to jail for a murder they weren’t in the room for. The next, subtitled The Devil’s Daughter, is all about Holmes trying to keep secrets as the world changes around him. There’s a brand new trailer to accompany the delayed release date announcement. Another for the burgeoning upcoming PC games list. Slight word of warning, it’s been labeled as a gameplay trailer by the folks who sent it to us, but there’s not a lot of that in there. Still fun, but don’t expect much puzzle solving when there are cinematic arrow dodges to be getting on with. Other than the engine starting to show its age, looks rather good. There’s an odd mix required for a good Holmes tale, requiring both the intrigue and slow-paced detectivising that the character is known for, with a touch of action to keep it interesting and stop it degenerating. This seems to be nailing the latter, while the former is much harder to show off in a trailer. As for the plot, there’s a mysterious clairvoyant moved in next door, Holmes for once in the middle of an investigation he wishes he wasn’t and the small matter of his child. All that and more now on June 10, delayed two weeks from May 27.